The hot air balloon cannot really be steered, it only travels as fast as the wind blows and is not really a practical form of transport. But if you just want to enjoy one of the most simplistic and peaceful ways to fly then this is for you. 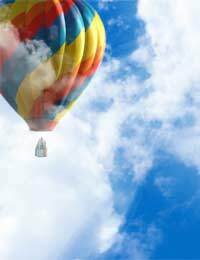 There are only three basic components to a hot air balloon, which are the envelope, burner and basket. The balloon envelope is used to hold hot air providing lift and is typically attached to a wicker basket. Burners fuelled by propane gas bottles are used to heat the air within the envelope so providing the necessary lift. A wicker basket attached to the envelope is normally used to carry the fuel, payload and passengers. The wicker basket is commonly used as it provides a degree of energy absorption during the sometimes-bumpy landing process. The trial flight not only allows you to find out if you like the experience of flying in a balloon, it also allows you to meet the people involved with the sport and ask them lots of questions about it. They will be more than willing to share there knowledge and passion on all aspects of the sport and by asking these questions you will not only find out what is technically involved but also about the social aspects of it which may be a deciding factor in taking your next steps. You may be making your first flight after being given a gift voucher from a friend or family member and it is up to you to call the flight company to make a booking. It is worth bearing in mind that the weather plays a very large part in the balloons ability to fly and you will probably be asked to call the company office on the evening before and/or on the day of the booking to check if the weather conditions are “likely” to be favourable for the flight. The call is no guarantee that the flight will actually take place as weather conditions can change hour by hour and may not be suitable for flying when you actually get to the launch site. Several re-bookings may be necessary before conditions are suitable for flying and the flight company may also have a backlog of people wishing to fly causing further delays to your booking date. Finding the launch site can sometimes provide a challenge as it may be located on a remote farmer’s field that is not always easy to find – so get good directions and a contact telephone number before setting off! The flight will typically take place either early in the morning or late afternoon when the wind tends to be at its calmest. During the ground preparations you may be asked to assist by holding ropes on the balloon during the inflation process. Initially cold air will be blown into the envelope partially inflating it followed by hot air to complete the process. Finally, pilot and passengers clamber into the basket and shortly afterwards there is the loud roaring sound as the pilot applies the burner to provide lift for take off. The basket creaks and very slowly and gently you start to rise above the ground. During the flight the world floats quietly by at a very easy pace, the views are spectacular and there is no breeze on your face because you are travelling at the same speed as the wind. Occasionally the roar of the burner breaks the quietness as the pilot applies more heat to the envelope so as to maintain height. The only other thing to break the silence is the chatter from the other passengers and the radio calls giving the balloon position to the ground recovery crew who are trying to follow the flight by road so that they can be close by when the balloon finally lands. All too quickly your journey is over and the pilot will select a suitable field to land in. Sometimes during the landing approach the landowner may wave off the balloon indicating that they do not wish you to land there! Once a friendly field has been found the landing process is normally gentle but can sometimes be bumpy. Because of this you will be asked to hold firmly onto the inside of the basket to protect your fingers just in case it topples and is dragged along the ground during touchdown.